Baltimore, MD (June 3, 2016) The Maryland Polo Club, the only venue for field polo in the greater Baltimore area, is pleased to announce the start of its 30th season on June 3 (weather permitting). Maryland Polo Club is situated in the heart of Monkton’s horse country where all equestrian disciplines are prevalent. The Club has continued to remain a family tradition as well as a United States Polo Association match venue for 30 years. Levels of competition range from Intermediate to Professional Goal. The 30th season promises to be one of the strongest season yet with 7 planned tournaments and club matches featuring skilled amateur and professional players in addition to talented youth players. In addition, the club will host its first ever Women’s Championship Tournament qualifier event, featuring some of the areas strongest female players and the quality of this fast growing part of the sport. Polo is an exciting spectator sport with a fast pace and the added challenge of human and equine athletes performing in unison. Played on a field the size of 3 football field, with four against four players, a match consists of six 7 1/2 minute periods called chukkers with a ten minute “halftime” after the third. Players change ponies during the short breaks between chukkers. The public is welcome to attend any matches throughout the season. Tickets can be purchased at the gate and are $15 per car. About Maryland Polo Club: The Maryland Polo Club showcases club matches and tournaments throughout the June to September playing season. At Maryland Polo Club, international professionals share the field with experienced and skilled amateurs, Intercollegiate and Interscholastic All-Stars and National Champions, rising junior players, and beginners of all ages. The club offers both competitive play and games that are ideal for player development. Polo is open to the public and also forms an ideal backdrop for your next corporate event or family celebration. 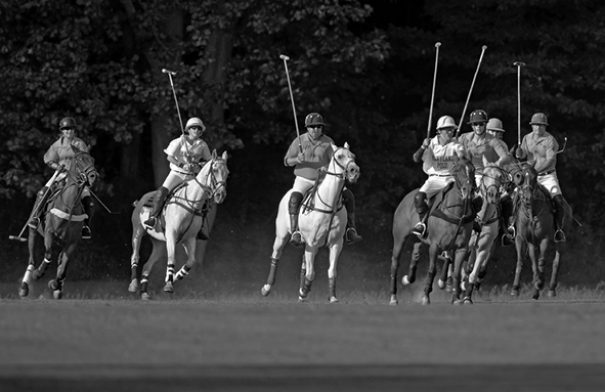 Matches are played every Friday at 6 p.m. and every Sunday at 3 p.m. Visit our website www.marylandpoloclub.com for more information.